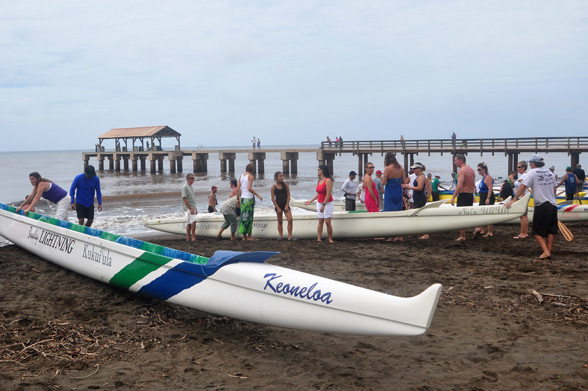 The local paddling season got off to a rousing start with the first long distance competition of the year at the Waimea Pier on February 19th. 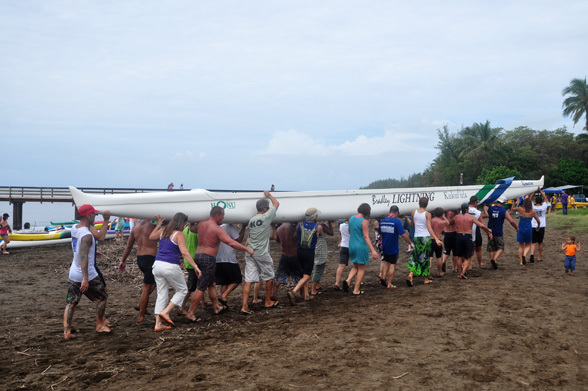 The occasion was the 20th Anniversary Warren Resquer Memorial Kilohana Long Distance Canoe Race. 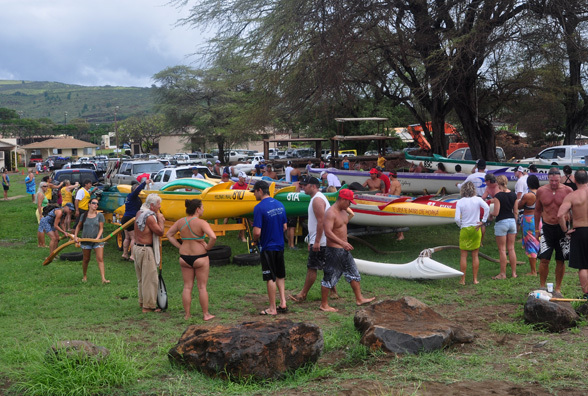 This competition was hosted by the Kilohana Canoe Club and sponsored by the American Savings Bank, bringing together teams from all over Kauai. In all, nine local canoe clubs gathered for a series of races followed by lunch and an awards ceremony. It’s quite clear that there is far more to paddling than a hefty dose of fun and exercise. Each club is composed of men and women who share a passion for the ocean. As a member of a canoe club, they truly work as a team to prepare the boats, hone their technique and learn how to coordinate their efforts to improve boat speed. It’s also important as a way to meet neighbors who share common interests. Regular events such as races and regattas that bring GICRA members together provide other benefits as well. 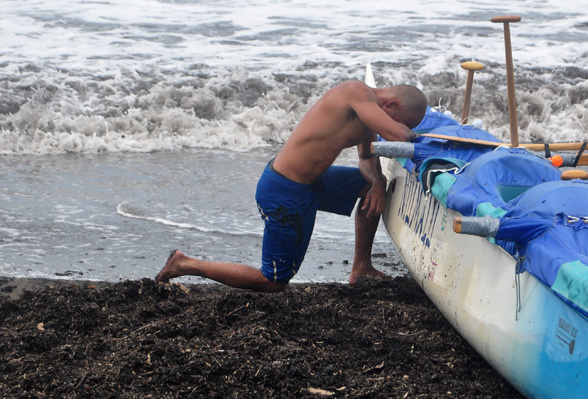 Teams learn about local Hawaiian customs and the historical significance of paddling. Although Kauai has a small population, people are distributed across a wide geographic area, so teams also get a chance to meet friends from far-flung reaches of the Garden Island. Kauai is famous for it’s relaxed, friendly residents, but many people have a competitive streak that needs an outlet – periodic races provide just such an opportunity in a fun setting. 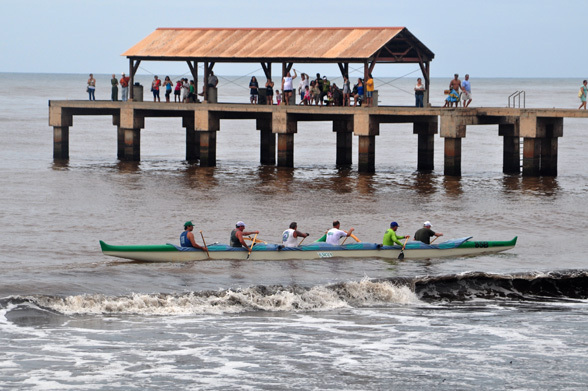 The races started and finished at the Waimea Pier on the island’s west side. 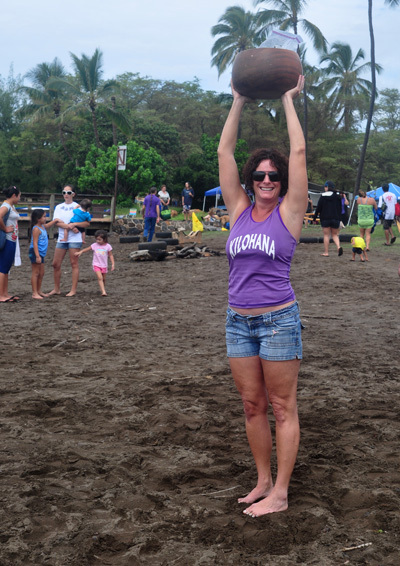 The beach was filled with boats and crews competing in several groups, including kane (men), wahine (women), mixed, masters and novice divisions. 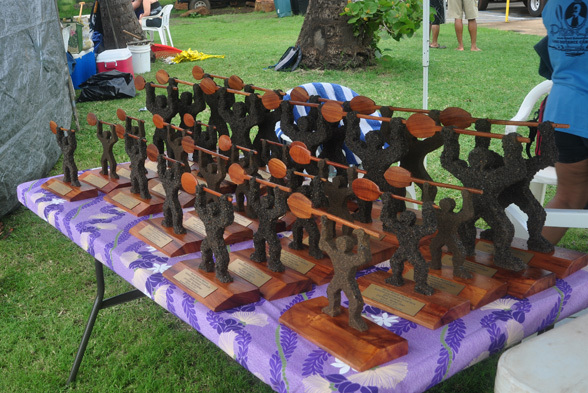 Clubs were vying for unique trophies constructed of local materials in a traditional Hawaiian motif. The races were not only fun for the paddlers, it was a great experience for the spectators as well. There is the excitement as the teams hit the water from the beach, and the flurry of activity at the finish as teams power through the surf to the finish. 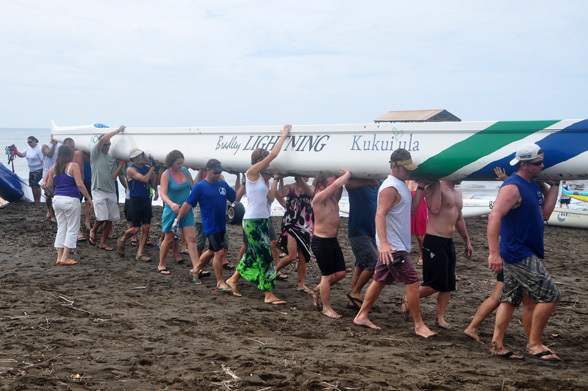 An historic Hawaiian tradition was introduced to the race this year, as each team was given a small fish to carry on board, symbolizing the Hawaiian spirit and the cultural connection between the racers and the environment. When a boat reached the shore, one team member would take the fish and sprint to a bowl held high by a woman on the beach. The race result wasn’t official until the team placed the fish in the bowl. If the fish was lost at sea, the team would be disqualified, so each team took care to secure the fish while racing… and have a fast teammate deliver the fish to the bowl! 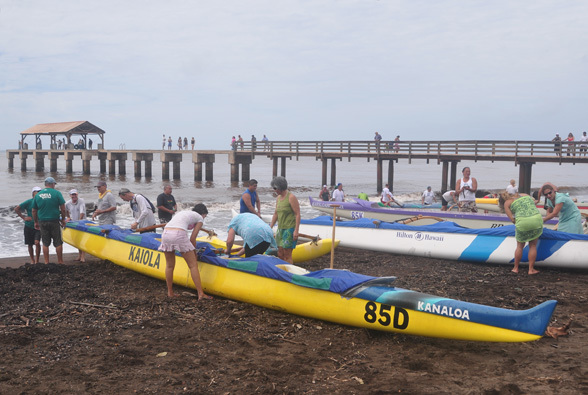 After a long day of racing – the first race began early in the morning – the beach was filled with tired, yet happy paddlers loading up the canoes, stowing their equipment and washing off all that salt spray. The competitors, their family, and friends all enjoyed good food, good drink and lots of laughter well into the late afternoon. Races are scheduled throughout the year on Kauai as well as neighboring islands. We’ll keep you informed as to upcoming races and events.